Faculty of Physics and Information Technologies of Moscow State Pedagogical University takes its rise in 1872, when at the initiative of professors of the Moscow Imperial University (now Moscow State University) Moscow Higher Women’s Courses were established. They included physical and mathematical department as well. 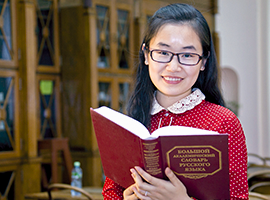 Seeing that Higher Women Courses arose as a branch of Moscow State University, the majority of teachers of Moscow Higher Women’s Courses were university professors. 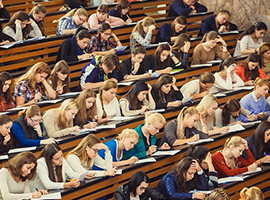 Physics as a subject was included to the list of compulsory subjects for 2 hours per week for all trainees since the first years of Moscow Higher Women’s Courses existence. The beginning of the Faculty may be considered in 1900, when at MHWC Faculty of Physics and Mathematics was established, and from 1918 – Faculty of Physics and Mathematics of the 2nd Moscow State University. In 1921 the Faculty of Education was established at the 2nd Moscow State University which included physical and mathematical department. In 1930 the 2nd Moscow State University was divided to 3 separate institutes (Moscow State Pedagogical Institute — MSPI, 2nd Moscow State Medical Institute and Moscow State Institute of Fine Chemical Technology). Faculty of Physics and Mathematics worked as a part of MSPI. In 1960 after the amalgamation of Moscow State Pedagogical Institute n.a. V.I. Lenin and Moscow State Pedagogical Institute n.a. Potemkin the Faculty of Physics was separated from the Faculty of Mathematics. In 1991 Moscow State Pedagogical Institute n.a. V.I. Lenin returned its legitimate university status and became Moscow State Pedagogical University (MSPU). Over the years, at the Faculty of Physics and Mathematics of MSPU (later at the Faculty of Physics) many worldwide renowned scientists have worked: S.A. Chaplygin — Director of MHWC, F.A. Bredikhin, V.I. Vernadsky, A.V. Tsinger, A.A. Eichenwald, P.K. Shternberg, A.G. Stoletov, G.S. Landsberg, V.G. Fesenkov, O.Y. Schmidt, P.A. Rebinder, A.Y. Khinchin, Nobel prize winner I.E. Tamm, laureates of State prize E.V. Shpolsky, M.S. Rabinovich, E.M. Lifshits, E.M. Gershenzon, V.S. Etkin as well as N.N. Malov, D.I.Sakharov and the man who taught physics all over our country — A.V. Peryshkin. 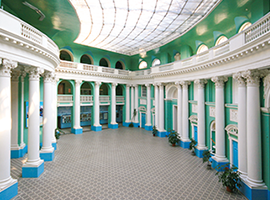 In 2006 the Faculty of Physics of Moscow State Pedagogical University was transformed into the Faculty of Physics and Information Technologies in connection with the opening of new specialties and specializations as well as with major research results in relevant areas of science and technology. The interdepartmental center «Nanotechnologies» includes educational and scientific radiophysical center and educational and scientific center of nanomaterials. In the very center of Moscow the Observatory of MSPU is located. It has been in existence since 1904, when E.S. Tryndin, shop owner «Fizpribory», opened the observatory on one of the seven hills of the capital to demonstrate optical devices. As students, academicians A.A. Mikhailov and M.O. Nabokov worked there. After the revolution of 1917 the All-Russian Extraordinary Commission was located in that building, but the observatory kept retained. In 1919 it was transferred to the jurisdiction of Astronomy Commission of Moscow Board of Education. The main purpose of the observatory was to popularize astronomy among the masses. During the first 15 years of its existence the observatory was visited by over 100 000 people. Since 1921 a big scientific work has begun in the observatory, an expedition was sent to observe the solar eclipse in Murmansk. At that time Moscow Society of astronomy fanciers worked there, and from 1924 – Society of interplanetary communications, which was the first not only in our country, but in the world. In Austria, a similar society was established in 1926, and in Germany — in 1927. At the present time under the cupola of the observatory on the observation deck of Faculty of Physics and Information Technologies the Telescope ABP-2 is installed, which is the third largest stationary telescope in Moscow. Much attention at the Faculty is paid to student self-education. High performing students have the opportunity to study by individual plans. Students do research and work at the departments of the faculty. Many years the faculty has a Students’ Scientific Society (SSS), which brings such students from different courses together, who are interested in science, who is not only smart, but hardworking. For many years there were student TV and radio at the Faculty, and now after a break they will resume their work. But student’s life — it’s also parties and concerts, discos and shows. It’s holidays Dedication to Students, Student’s Farewell Bell and Student’s Equator. It’s bus travels and walking-tours. These are wonderful friends for life! Address: Moscow, 119992, Malaya Pirogovskaya, 29. Tel. / Fax: (499) 246-58-86. Location: underground station «Sportivnaya», exit to the street “10-letiya oktyabrya”, turn right and walk for 3-4 minutes on foot.